When the French explorers first came to the upper lakes, they found the lake country from Mackinac to Lapointe and the northern part of the lower peninsula, occupied by the Chippewas, or as the French named them, the Ojibeway Indians; a part of the great Algonquin family, then one of the most powerful Indian nations of North America. When the Americans became possessed of Michigan the early settlers found none of the Iroquois, but in their place large numbers of Chippewas, and some Ottawas, under various tribal names. It was from them the Indian titles to most of our lands were obtained, and to them most of the reservations in Michigan and western Canada were secured. I am not aware of any authentic history of this change of possession, or how the Chippewas became possessed of the lands of the Iroquois. The Hurons, by themselves, were not powerful, but associated with, and as part of, the Iroquois, they might well consider themselves invincible, and entitled to much of the renown that attached to that remarkable confederacy. I have what follows, from one of the most venerable and worthy men of Michigan, Hon. Zephaniah W. Bunce, now approaching his ninety-sixth birthday. As stated in the sketch of the history of St. Clair county, he came into the town of Port Huron in May, 1817, and soon after entered into the fur trade. Great numbers of Chippewa Indians were in his immediate neighborhood with whom his business brought him in constant contact, and with whom and their language, he became familiar. Among others that he knew, was Nimekance, a principal chief of the Chippewas, whose house was on the reservation, near Port Sarnia, opposite Port Huron. Nimekance had been a great warrior, and with his nation, joined the English, and was with General Sinclair in most of his campaigns against our people. As a reward for his services and bravery, the English had conferred upon him special marks of honor, and given him the dress and uniform of a brigadier general. Within a year of his death, at the age of 106 years, he walked several miles to visit Judge Bunce, wearing and displaying with great pride, his English uniform. Nimekance also loved to dwell upon the prowess and exploits of his father, Kioskance, the great chief of the Chippewas, and who, he said, had driven the Iroquois far to the east from Michigan. As he related the story, his father, Kioskance, was the king or principal chief at the head of the Chippewas at Lapointe, on Lake Superior, and moved with most of the nation to the country and islands near the Sault and Mackinac. They found the country to the east of Lake Superior as well as to the west, cold and bleak, and not abundant in game. Iroquois, or more especially the Hurons and Wyandottes, their ancient enemies, held the warmer and pleasanter lands at the east and to the south of lake Huron. The Chippewas claimed that they had once held and been unjustly driven from these favored hunting grounds, and the Iroquois being involved in the wars between the French and English, they resolved, under the lead of Kioskance to make a determined and well concerted effort to drive them from their possessions. 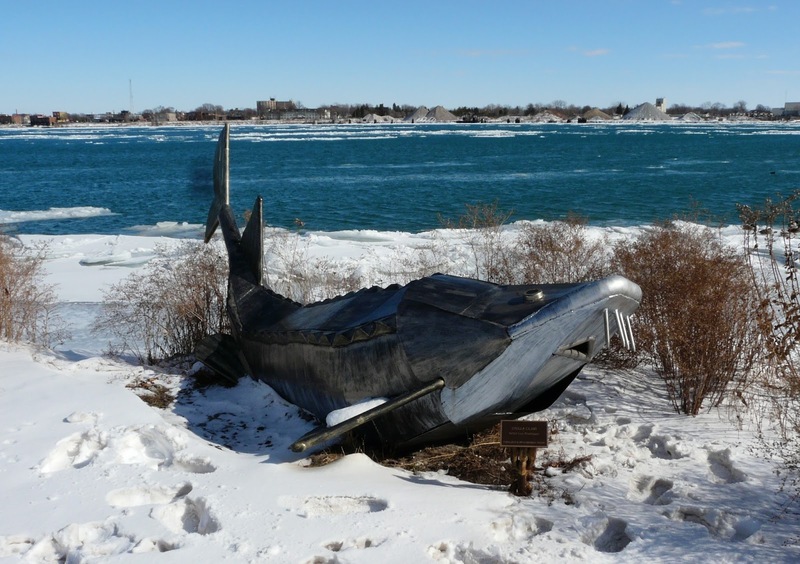 Kioskance gathered his warriors and launched in 400 canoes to traverse the waters of Lake Huron. A part came up the Saginaw bay, and landing on that river pursued their course by land, so as to strike the Wyandottes near Detroit, while the larger part followed the coast to the St. Clair river, landing near the mouth of the smaller stream, since known as Black river, and passing a large camp of the Iroquois at the foot of the lake, near what is now known as Fort Gratiot. Nimekance, then a young man, came with his father and described the canoes as holding eight warriors each, and enough to extend the whole length of the big river. Scare [sic] had a landing been effected when the battle commenced; a battle, as described by him, unequaled in any strife where Indians alone were the combatants. From side to side of the stream since known as Black river, the contest surged, till after days of terrible carnage, the Iroquois yielding, were driven across the great river and far into Canada. The detachment sent against the Wyandottes had been equally successful, and the two conquering forces joining, stopped not in pursuit until they had driven their ancient foes across the Niagara. Numbers of great burial mounds, filled with skeletons, Indian weapons, and ornaments, until a recent day attested the terrible slaughter. One large one[,] on the ground now covered by the United States custom house was devoted to the distinguished Chippewa braves. There were too many to be placed in bark tombs above ground, after the usual manner of Indian burials, and they were buried in a mound of earth. Kioskance returning from his victorious pursuit, ever after made his home near Fort Gratiot, and died about 1800, at the advanced age of over 106 years, was buried in his English uniform, on the same mound with his father, great numbers of his people assembling to honor his memory. How much reliance may be placed upon the story of Nimekance I will not pretend to determine, but there are many evidences that indicate its general truth, not perhaps of the number of canoes and warriors, but of the fact that the Iroquois were driven away and the Chippewas remained in possession as conquerors. Judge Bunce gives it implicit credit. Nimekance left five children, two sons and three daughters; one of whom, Mrs. Ogeetee, or Ogeetz, died on the Indian reservation, near Sarnia, in 1882, at the age of 107 years. When the Indian reserve, known as the Riley reserve, covering the western portion of Port Huron and the ground on which the custom house stands, was released and put in market, the friends of the Indian chieftains caused their bones to be removed to a burial ground in the south part of the city. That has since been vacated, and in the removal all trace of their remains have been lost. 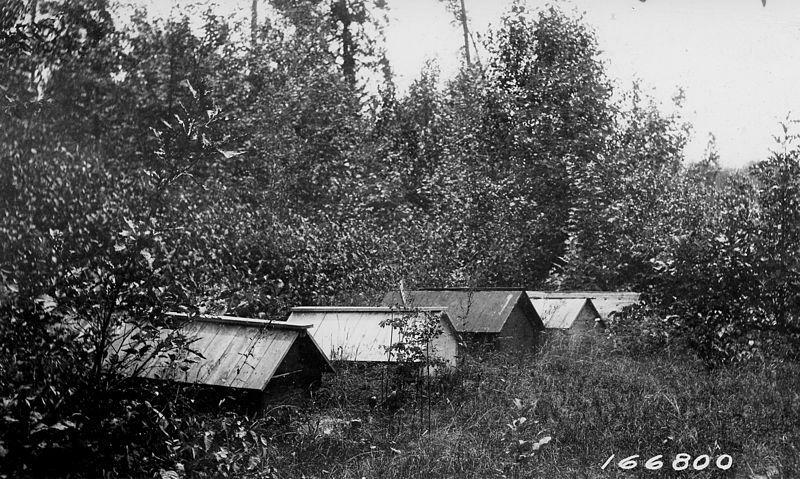 A 1922 photo of Native American burials. This image was included in “Native American ancestral remains to be reburied at Michigan tribal cemetery.” It is presently unknown if the burials referred to in this post’s article, “bark tombs,” would look the same as these. Nimecance, or Lightning, a son of old Kioscanee, served under Sinclair, on garrison duty, in the old fort at the mouth of Pine River. Judge Bunce states that when he came to the county, this Indian was one hundred and five years old, five and a half feet high, energetic and capable of attending to his corn-field, four miles south of Black River, as well as to the chase. Every New Year’s Day, he was accustomed to sail down the river in his large birchen canoe, on the bow of which he would fling the American colors to the breeze. On such an occasion, he would don his gold-laced coat, beaded moccasins and leggins [sic], and all the ornaments in his possession. Nimecance reached the age of one hundred and twelve years. It is related that Kioscance was chief of the Otchipwes in their wars against the Wyandots and Six Nations. In his expedition from Lake Superior to Lake Erie, his fleet was so extensive as to cover the St. Clair River from Fort St. Joseph, or Gratiot, to Walpole Island. On his return from the lower lakes, he camped at Fort Gratiot, and afterward made the district his home. Nicholas Plane, Sockscotowa, is a grandson of Nimecance, and chief of the Sarnia Indians. Shignebeck, a brother of Nimecance, was one hundred and nine years old at the time of his death. Mrs. Ogotig, a sister of the chief, lived to the age of one hundred and seven; old mother Rodd is said to have been one hundred and fourteen years old at the period of her death; Onsha, the third son of the chief of Kioscance, reached a very old age. The Koscance, or Rapid Tribe, must be considered the first actual settlers of St. Clair County. Previous to their coming, the Indian settlement was on the east bank of the river, about a mile northeast of the present village of Point Edward. This entry was posted in Geneaology, History, Michigan history, Native Americans, Port Huron, St. Clair County and tagged Chippewa, Great Lakes Indians, Northwest Territory, Port Huron, St Clair River by porthuronhistory. Bookmark the permalink.